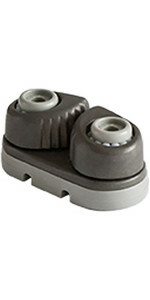 Allen Cam Cleats have had over 50 years of meticulous R&D to perfect their design. Available in either Alloy or Allenite* the jaw profile optimises rope entry and exit for smooth cleating and un-cleating, whilst double coil springs and ball bearing technology give consistently smooth cam action. The addition of the Mega-Pro Lead with wire reinforcement enhances cleating angles for superior performance and longevity.